Capitalists@Work: Will the Boundary Changes Happen? Will the Boundary Changes Happen? 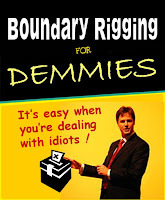 As one who strongly believes in devoting attention to issues in proportion to their importance, when it comes to UK politics I have long followed the Boundary Changes issue with keen interest. Readers may recall I excoriated Osborne for failing to see the LibDems were guaranteed to renege during the last parliament, and I have tended to assume he won't screw up again. After two or more decades (sic) of professional, determined - and strategically inevitable - Labour prevarication, this is the Once In A Lifetime Opportunity to get it right. Right? a FEW BY ELECTIONS AND THEY WON'T GET IT THROUGH. GOLDSMITH PROBABLY BE THE FIRST, THEN SOME TROUGHER CAUGHT WITH THE BISHOP. AND ANOTHER WILL MAKE SOME DUMB ARSED RACIST COMMENT ABOUT CALAIS AND HAVE TO BE REMOVED. MAJORITY OF 3 NEXT YEAR. AND SO ANY TORY MP LIKELY TO LOSE OUT WONT VOTE FOR IT. Now that is interesting. As it happens I don't agree with Mr Banana per se, but it triggers another line of thought. The reason I don't go with the above logic is that (a) the whips always offer to see any likely losers right - provided they behave, of course; and (b) there is no particular reason (bar the silly manifesto promise*) to stick with a reduced number of seats - it's only the boundaries that matter**. However, the prospect of a single-digit majority after a couple of Events does make the whole thing rather tasty. Because every other party (barring the DUP?) has an interest in opposing boundary changes, thus giving the bastards an acute pressure-point. Would they use a close vote on boundary changes to try to exact something on Europe? Or is a vote needed at all (see notes below)? What's the word in the '22, Mr Q? * runs as follows: We will implement the boundary reforms that Parliament has already approved and make them apply automatically once the Boundary Commission reports in 2018 . 2018, eh? Three years of squeaky-bums all round. ** the reason the Tories carried through with the reduction in total numbers of seats in the last parliament, but not the boundary changes per se, was (I am told) that (a) the minority parties - all of them, LibDems included - would have prevented changes in Scotland, Wales & N.I but voted through the seat-reductions in England only, hah hah. So the changes were never put to the vote. 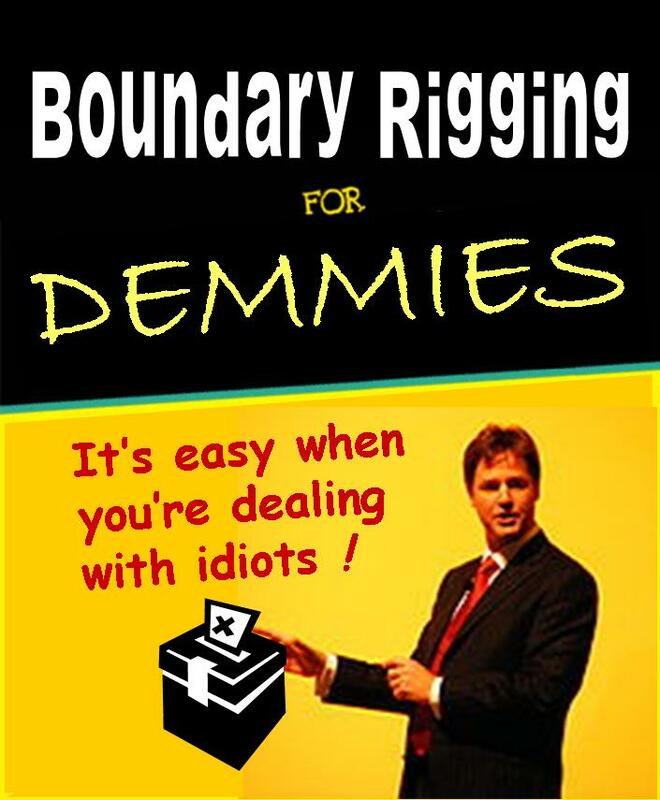 But (b) the LibDems had signed up for the reduction in total number of seats and were prepared to stick with that. Tory strategists (pah!) felt that if the reductions went through (as they did) the Boundary Commissioners would be bound to make at least some rectification of the distribution of voters when implementing the new, reduced number of seats: a distinct second-best, and only of putative assistance in 2020. MPs as a class are more dishonest than the general population. One way of measuring that is to compare the percentage prosecuted/ sanctioned for expenses cf the number of benefit claimants prosecuted / sanctioned. The thing Mr Kong misses is that this is not a party political thing and so there will be MPs caught snorting coke off other peoples bottoms, but they are roughly as likely to be Lab and Con. Personally I think attention will still be focussed on Cyril Smith / Ted Heath (dead people cannot sue)/ Rotherham (minicab drivers are not a racial group) for a long time. But if I were BQ, I would be double-checking the cleaners immigration papers right now. In 2018, there'll be a new commission into the efficacy of commissions into boundary changes. Just to keep it bubbling along. Ah but Andrew, in Rotherham minicab drivers ARE a racial group (and in a number of other places too). I understand from the BBC that Rotherham taxi drivers are from South Asiaier. This South Asiaier region extends from don't know where all the way to don't could be anywhere. But its definitely a big, hot, crowded, region of the planet in which religion plays no part. On the boundary issue, skeptical, seems to be the mood. In the main the changes favour Tory MPs, who are under represented. But reducing MP numbers , unless that's from Scotland, is not welcomed and there will be trouble. ND is correct though. The oldies with safe seats will be offered a Lords job to push off early. So making a vacancy for any current Tory seat incumbent that have seats that begin to look unwinable and fancies a move. Cabinet posts are also influential - The new seats go to the coming noob intake to battle..
As for the Heath story, Radders had a good piece on this on his blog. Who benefits if a dead Tory MP is accused by the front runner of the labour deputy leadership race at a time when serving Labour MP is soon to be named ? Nick, I won't make a prediction, following T Blair's example. I don't see why the leadership would not want to push this through right away, though. As for the bit of manifesto you quote, does that not imply two rounds of reform? One now to sort out the basic injustice, and then an automatic acceptance of whatever the Commission proposes in 2018?